This is a pristine nature refuge at the base of the Blue Ridge Mountains that includes a trout stream, a two-acre lake with nesting areas for a variety of birds including wood ducks, woodpeckers, wild turkeys and numerous other species (humming birds are frequent visitors to the house in the summertime). Surrounding the main house is lush mature landscaping including thirty-five Japanese maples directly from Fredric Law Olmstead's plantings at the famous Biltmore House Estate in Asheville, North Carolina. The property includes woodlands, streams, springs and pastures and is perfect for those long walks among nature's gifts. The perimeter of the 150+ acre property is 5 miles (8 km). Additionally, there is a contiguous 140 acres (57 h.) that is also available. The property has two year-round streams. One flowing through the Western valley supplies a lake. The other in the Eastern valley is the larger of the two and has small trout. These trout come downstream seasonally from higher on the mountain. Other ponds and small lakes could be created from the larger stream. Picnics by these streams are a favorite. Thomas Jefferson originally bought his wines from this region of North Carolina and now, with the recent designation of the Yadkin Valley Appellation, more than a dozen wineries have been established here and continue this grand tradition. Most are only minutes from the property. And at 1400 feet elevation (427 m.) on the sheltered, Eastern, side of the Appalachian Mountain chain, this property is ideally situated for productive viticulture. There are currently more than 50 wineries in North Carolina. Currently about half of the property is wooded and half in meadows and pastures. 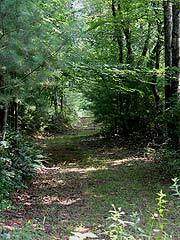 In the wooded areas hardwoods and softwoods abound in an amazing variety, some quite large. A complete Forestry Plan has been developed and may be executed at the discretion of the new owner. Selected timbering is another option with considerable income potential. No chemicals have been used on the soil. The topsoil in the valleys is of an almost unheard of quality. In some places the topsoil is up to 5 feet thick (1.5 m.). It is a rich black sandy loam perfect for any plant or crop. Many areas of the country have been stripped of useable topsoil. This is truly a unique opportunity to raise your own healthful organic food. Other than the perfect ‘Gentleperson’s Farm’ and a wonderful place to rear children, there are a number of uses the property could be exploited for. They range from bottling the high quality water, a cattle operation (a beef cattle plan was developed and demonstrated that up to 200 head of cattle could easily be accommodated), a timber enterprise (plan already in place), high-end farm crops (organic vegetables for restaurants), landscape plants, aquaculture, Christmas trees and numerous other possibilities. The fields are currently growing alfalfa, for horses. Or just use the entire parcel for luxurious privacy. The lake, approximately 2 acres (.8 h.) is a delightful recreation feature. Fishing, boating, swimming picnicking and occasionally ice skating are all possibilities. It is stocked with several fish species and there are several types of turtles in residence. The lake is a primary nesting site for numerous bird species from Great Blue Herons, Green Herons, Kingfishers and Eastern Mountain Bluebirds. Open pasture, fields and trails through the connecting woodland are ideal for raising and riding horses. The flat expanse of the lower pasture bordered by free running water is also suitable for a riding and training ring if you have an interest in horses.